Here is a quick example of how to quickly build a reference collection in BibSoup, using the great source of knowledge that is Wikipedia. To begin with, you might want to go to Wikipedia directly and try performing some searches for relevant material, to help you put together sensible search terms for your area of interest. 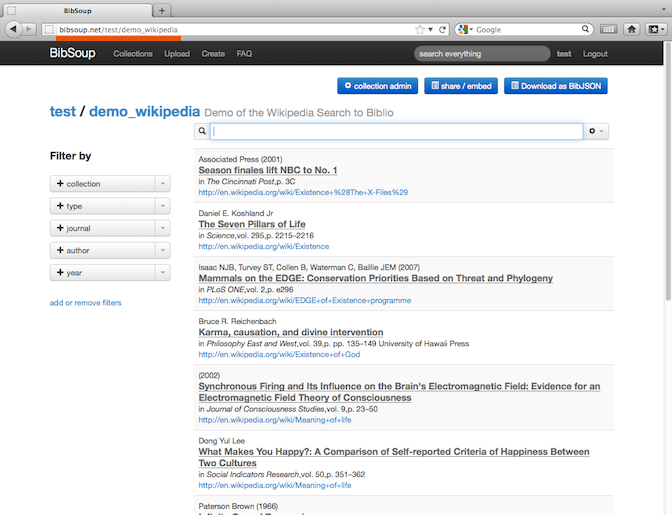 Your search terms will be used to pull relevant citations from the wikipedia database. 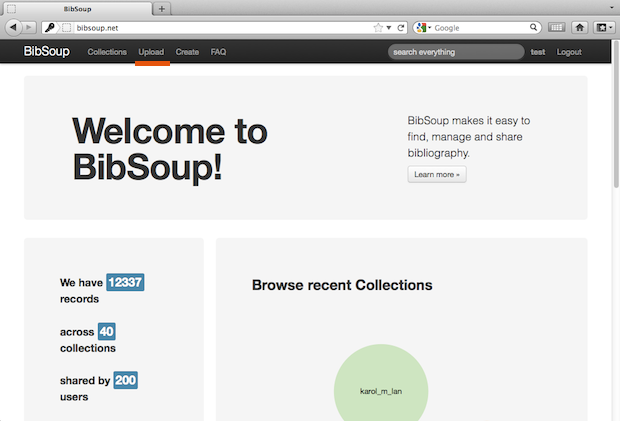 Then, go over to the BibSoup upload page; signup / login is required, so do that if you have not already done so. Type in your wikipedia search terms in the upload box at the top of the page, give your collection a name and a description, specify the license if you wish, and choose the “wikipedia search to citations” file format from the list at the bottom. Then hit upload. A ticket will be created for building your collection, and you can view the progress on the ticket page. 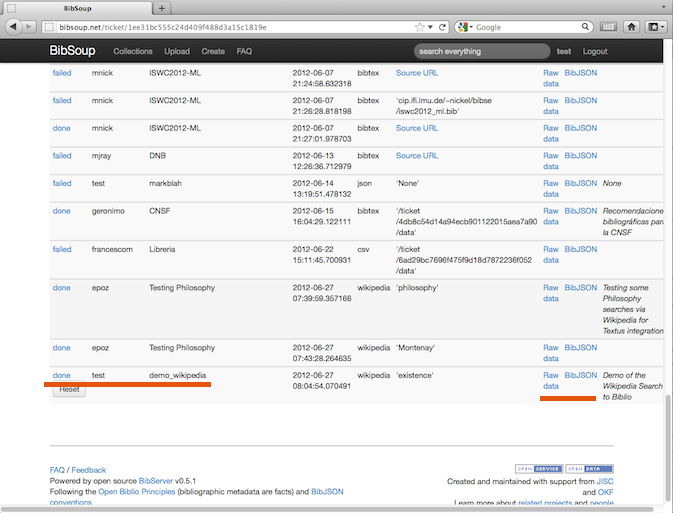 Once it is done, you can find your new collection either on the BibSoup collections page or on your own BibSoup user account page – for example atfor the user named “test”. 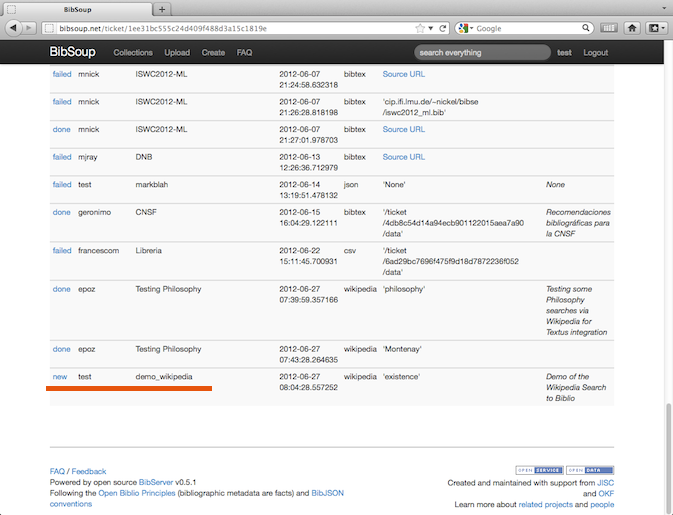 Also of course, you could go straight to the URL of your collection – they appear at http://bibsoup.net/username/collection. There you go! You should now have a reference collection based on your wikipedia search terms. Check out our our example. 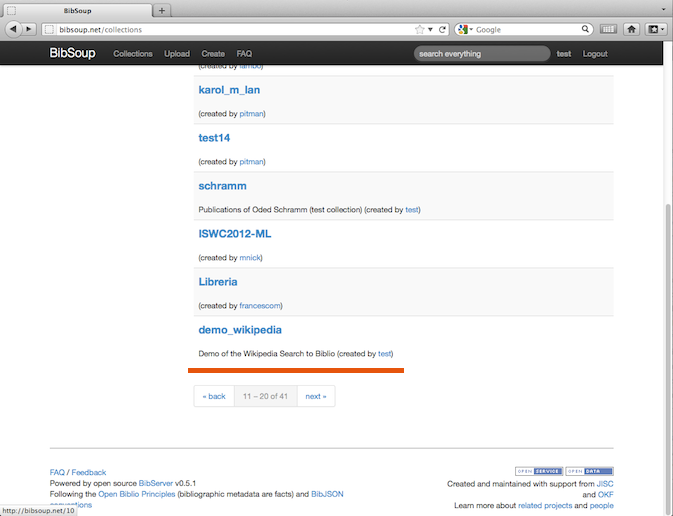 This entry was posted in BibServer, JISC OpenBib and tagged jiscopenbib2, wp2, wp8. Bookmark the permalink.